Google has once again stepped up their attack on international link spam by announcing they have taken action against two link networks, one European and one German. One of the networks was centralized in Germany, however the one that Google is describing as a European network is referred to such because of the geographical coverage the link network covers. As such, the one they are calling the “European” network is likely very large in size and scope. There is currently a bit of speculation on Twitter (non-English) about which networks got hit, but no confirmation yet. 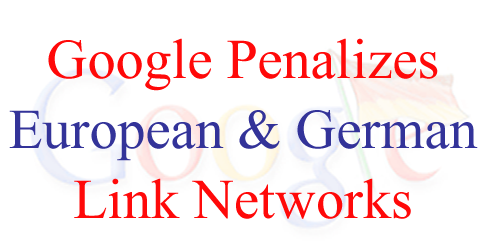 Usually when Google announces publicly they have taken down a link network, it is because it is a noticeably large one – which this European one likely is. Affected webmasters should start receiving their link penalty notices within Google Webmaster Tools soon, if they haven’t already. Carolina Kruszyńska and Johannes Mehlem from Google’s Search Quality team in Dublin have both confirmed the action against the link networks. Kruszyńska’s tweet links to a Polish search quality pages about link networks while Mehlem links to an earlier blog post on the German Webmaster Central blog about link networks. Google has made a point of going after many link networks this year, including a previous ones in Germany. They also recently took down two private UK link networks. I have reached out to Google and will update with any new information. Barry Schwartz confirms that rankseller.de and teliad.de were two of the networks hit. Neither of the companies currently rank for their own name in Google, although searching for “rankseller.de” and “teliad.de” brings up their sites in Google. Google doesn’t have additional information at this time, although they have shared the following post on Google+.